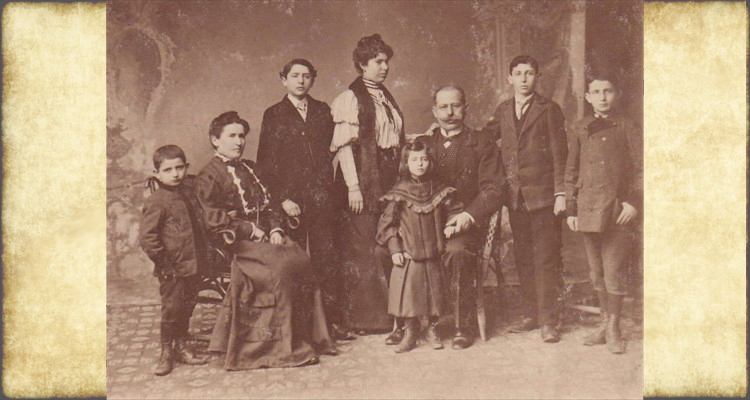 Left to Right: Max J., Berta Schafer J., Hugo J., Gisela J., Anna J., Siegmund J., Siegfried J., Karl J. This photo was probably taken between late 1914 and June 1915. The last drop of blood. The logo of the C.Righetti photo studio in Trento, Italy and information about the location and all of the studio's services appear in Italian on this reverse side of the photograph. This photo was probably taken between late 1914 and early 1917. There is no inscription on the photo's reverse side. Hugo is standing at the left end of the 4th (back) row. We see him looking straight ahead with a serious expression, between the soldiers in the 3rd row standing second and third from the left. 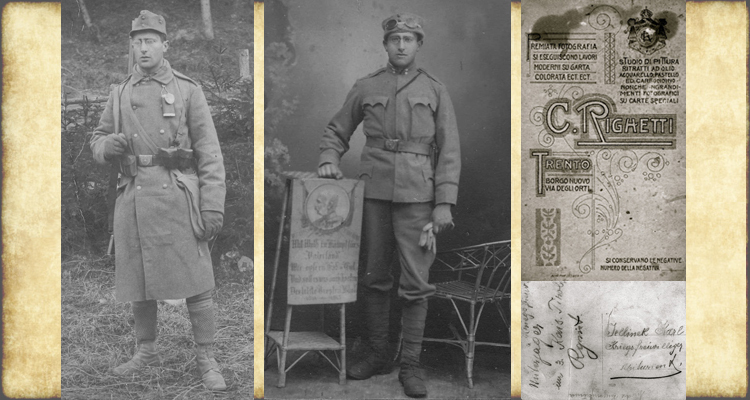 LEFT: Hugo Jellinek, who served as a medic in the Austrian army, appears on the right side of this WWI photo, along with two ambulance drivers. However, Hugo wrote and sent this photo-postcard after he was wounded in battle, captured by the Russians, and recovering in a prison hospital in Samarkand, Uzbekistan. See also Hugo Jellinek's biography for more information. RIGHT: Reverse side of the photo. A memento from your Hugo, who loves you dearly. "Prisonnier de guerre" is written in French. However, evidence that these words were hand-written by someone accustomed to writing in Russian is provided by the crossing out of the loop of the letter "g", to make the letter "d" in the middle word "de" of "Prisonnier de guerre." The Russian Cyrillic alphabet uses the Roman letter "g" for the "d" sound. The word written in the upper right stamp area of the card is the Russian word for "Austria." The absence of a stamp in this space indicates that this postcard was included in a batch mailing or a diplomatic pouch. This reproduction of an ink and watercolor wash painting was used as backing material for Karl Jellinek's 1922 Doctor of Law diploma. It had been cut slightly on its right side, to fit underneath the diploma. The print was discovered in 2007, when the diploma was removed from its frame and glass covering in order to photograph it. The title of the print, written in Hebrew, is "Kol Nidre" (English: All Vows), the name and opening words of the first prayer that ushers in the service (known also as "Kol Nidre"), on the eve of the Yom Kippur (Day of Atonement) holy day. In memory of the great world war in 1915 at the Battle of Lemberg. "Gesetzlich geschützt" ("Protected by law"). 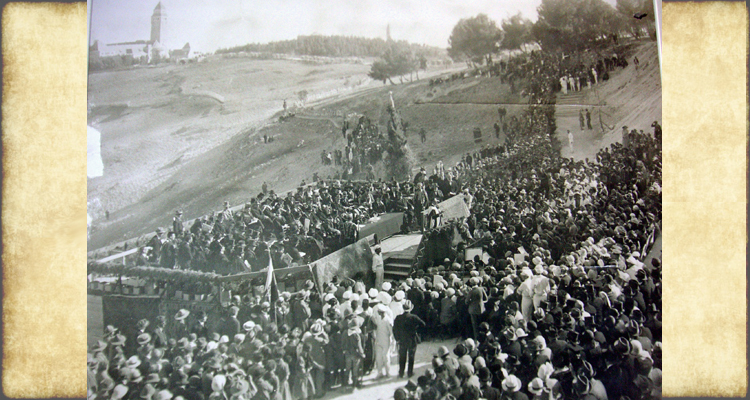 The formal opening ceremony of The Hebrew University of Jerusalem took place on Mt. Scopus on April 1,1925. Karl Jellinek was present at this historic event, representing the Zionist association he presided over at the time: Der Lese -und Redehalle, jüdischer Hochschüler, in Wien (The Reading and Lecture Hall [Association] of Jewish [University] Students in Vienna). 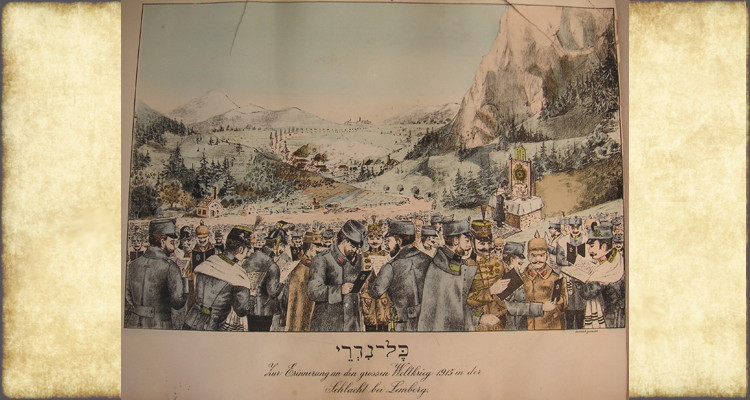 Karl was proud to have been present there, among the leaders and representatives of world Jewry. He often said “this day was one of the happiest days of my life.” Karl was glad to point out that he was discernible among the crowd in this photo, because he was standing near the flag-bearer of the Zionist Academic Society of Warsaw, and the photographer’s focus seemed to have included the area of that flag-bearer. Karl Jellinek can be identified in the cropped view in the next image, by the blue circle around him. LEFT: Close-up of Karl Jellinek from the previous image. RIGHT: Close-up of photographer’s insignia and some of ceremony onlookers, seen in the bottom, left-of-center of the full image. It is interesting to see the profile photo of Theodor Herzl, the activist founder of modern political Zionism, prominently on view to one side of the organization's insignia on the back wall of this meeting room. This Viennese Jewish association was founded in September 1894 under the name of "Jüdische akademische Lesehalle in Wien," but the name was changed in 1899 to the longer name above. The Nazis 'officially dissolved and expropriated the library of "Die Lese - und Redehalle..." in September 1938. This close-up view, with Karl Jellinek at its center, can help the viewer locate Karl in the full group photo. Karl can also be identified as the earnest, tall man in the third row of the full photo, standing a little to the right of center, wearing glasses and a tuxedo. 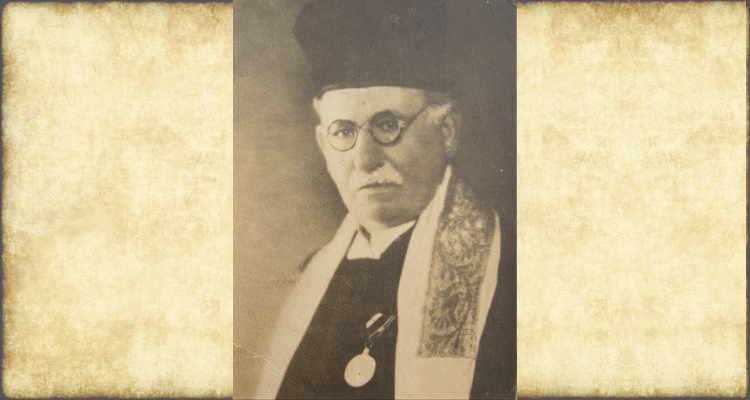 Karl Jellinek was President of this organization for some years in the 1920s and 1930s and was the group's delegate to the opening ceremony of Hebrew University on Mt. Scopus, Jerusalem in 1925. 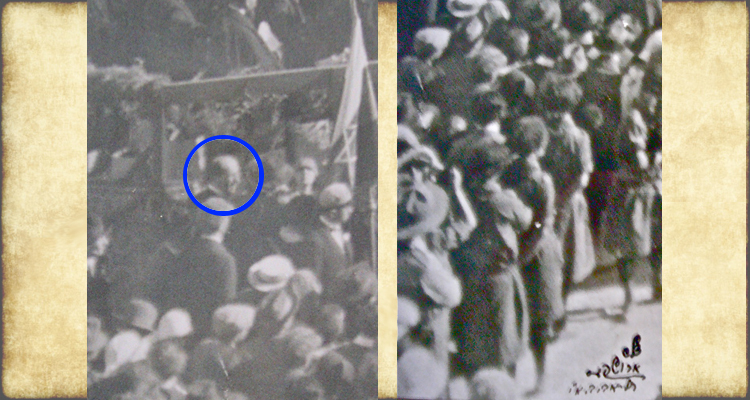 The two preceding images show this April 1925 ceremonial opening, in which Karl can be discerned among the attendees. 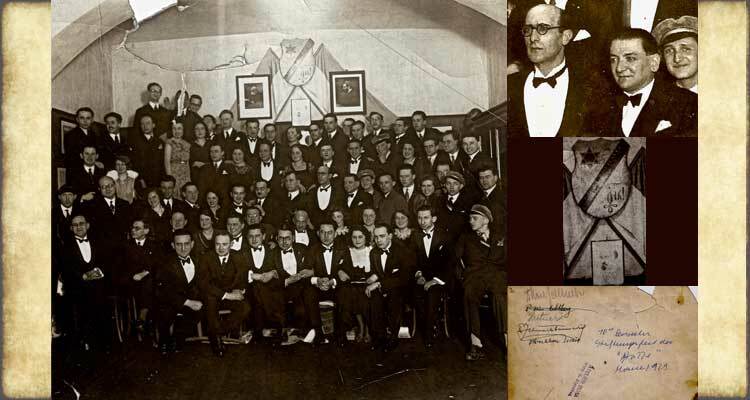 BOTTOM RIGHT: Reverse side of "Die Lese - und Redehalle jüdischer Hochschüler in Wien" Founder's Day group photo. The names handwritten on the left side include "Dr. Karl Jellinek", as well as fraternity brothers "Dr. [Joshua] Kohlberg" and [Rabbi] "Heitner", who emigrated to then-Palestine from Vienna, and with whom Karl corresponded for many years and met again in Israel in 1972. The words "70th Semester Stiftungsfest der 'Halle' March 1929" (70th semester Foundation Festival of the "Hall") were written by Karl, probably many years later in the USA. "Halle" was the shortened, informal way of referring to this fraternal association. Siegmund J. is wearing his cantorial attire and his government medal received for counselling WWI veterans. His expression appears contemplative and somewhat sad. on the occasion of my fiftieth wedding anniversary. Photo taken in front of Siegmund and Berta Schafer Jellinek's home/synagogue in Hollabrunn, Austria, on the occasion of their 50th Wedding Anniversary. Top row standing: Anna J. Nadel & Miron Nadel, Karl J., Stella Pollak J. & Max J., Martha Hirschensohn J. & Siegfried J. Middle row: Gisela J. Schlesinger, Berta Schafer J. 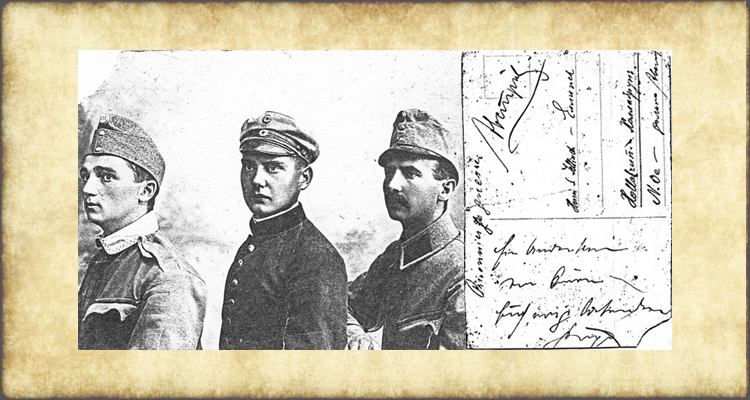 & Siegmund J., Hugo J., Leopold (Poldi) Schlesinger. Front row: Gisella Nadja J., Anna J., Erich J., Berta J. Additional photo taken in front of Siegmund and Berta Schafer Jellinek's home/synagogue in Hollabrunn, Austria, on the occasion of their 50th Wedding Anniversary, and the occasion of Gisella Nadja Jellinekl's becoming Bat Mitzvah. Anna Jellinek Nadel's husband, Miron Nadel, was the photographer. 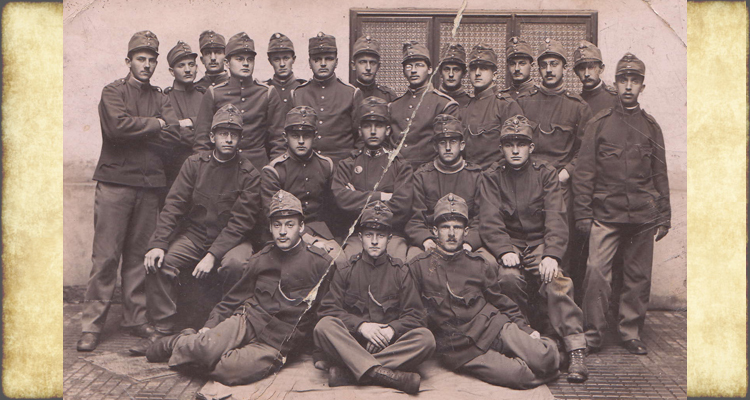 This photo and the preceding group photo of the more closely-related family members are the last extant Jellinek/Schafer family group photos. • The name "Jellinek" will be represented by "J." in the identification below of family members. • "[...?]" represents a completely unidentified person, or an unknown maiden or married name. • The names of Siegmund and Berta J. and of their six grown children, are in bold type. Seated in front row, on area rug on ground: Gisella Nadja J., Anna J., Erich J., Berta J. Standing 4th row: Elsa [...?] J. (Ignatz J. 's wife), woman with wide-brimmed hat [...?]. Daughters left to right: Gisella Nadja, Berta, Anna. On occasion of Berta's Confirmation. 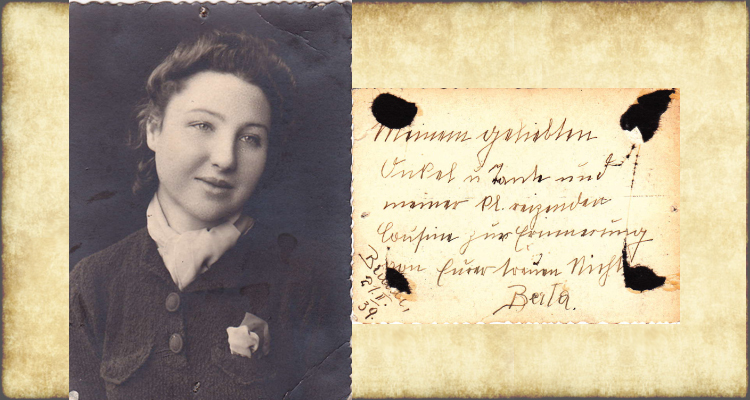 Handwritten inscription on reverse side of photo (not shown): "Andenken an die Confirmation der Bertha -- -- Juni 1935"
Translation: Memory of Berta's Confirmation -- June 1935. This inscription was probably written by Miron Nadel (Hugo's brother-in-law), who was the photographer. Miron Nadel's name and the Mariahilferstrasse address of his Viennese photo studio is stamped to the right of the inscription. 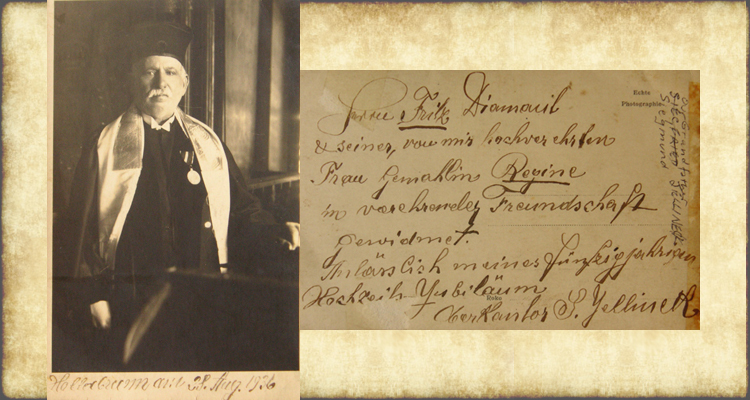 Siegmund J. in his cantorial attire, and wearing the medal he had received from the Austrian government. Hollabrunn, Austria,1937. "Mein geliebtes Vaterl in Alter von 80 jahren. Hollabrunn, 1937. Oberkantor S. Jellinek." Translation: My beloved father at 80 years old. Hollabrunn, 1937. Chief cantor, S. Jellinek. It is interesting to see this example of Hugo's beautiful calligraphic handwriting in modern script, instead of the old German Sütterlin script that he also masterfully used in the body of his letters. We can tell from the "BR" (Brünn) postmark that the letter was posted on the 25th day of a month in 1938. 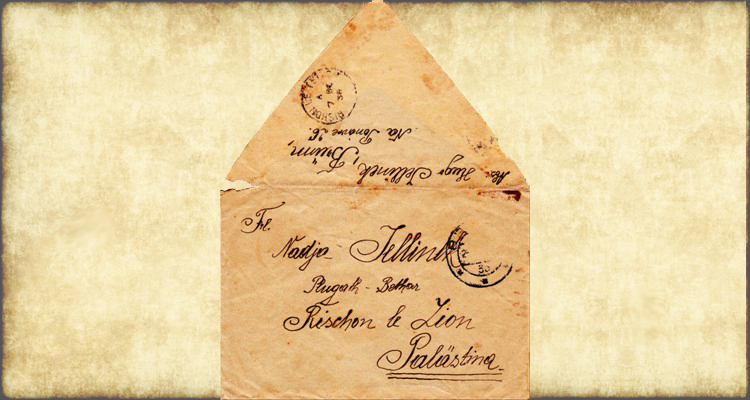 The more completely legible "Rishon LeTsion" postmark reveals that this envelope arrived in Rishon on December 7, 1938. November is therefore most likely the month in which this envelope was posted in Brünn, and the letter inside was most likely Hugo's letter dated November 24, 1938. (The Nov. 24, 1938 letter will be added to the letters on this website in the future). The Hebrew words "Plugath - Bethar" in the address denote the Betar Zionist youth group to which Nadja belonged. "Frl." is an abbreviation for "Fräulein" (English: young lady, girl, Miss) and "Abs:" is an abbreviation for "Absender" (Sender). Photograph taken before Karl J., Kreindel/Karla Eckstein J. and infant daughter, Michaela J. 's life-saving departure from Vienna. 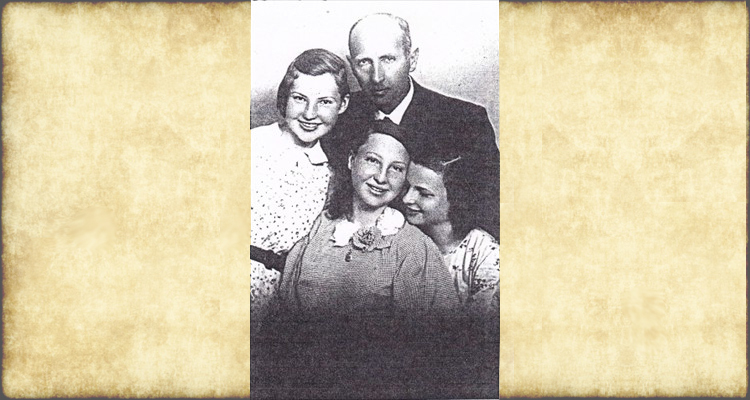 Standing, Left to Right: Clara Anna E. Bertisch (Kreindel/Karla’s older sister), Karl J., Kreindel/Karla E. J. 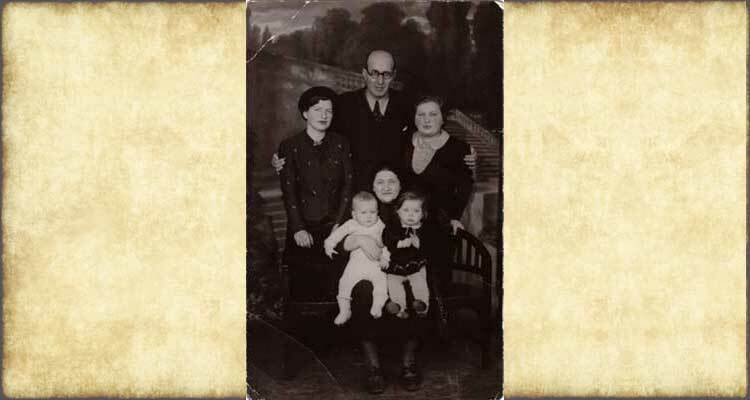 Sitting, Mathilde/Manzie Eckstein (Kreindel and Clara’s mother), holding her grandchildren on her lap; Israel Bertisch (Clara's son) on Mathilde’s right side, and Michaela J. (Karl and Kreindel's daughter) on Mathilde's left. Anna is about 15 years old in this small photo. She is not smiling, but rather her face shows a mix of seriousness, sadness, disillusionment, resignation and strength. RIGHT: Inscription Handwritten by Anna in 'modern' German script. This small portrait photo of Berta shows her at about 16 1/2 years old, with an open, wistful and gently smiling expression. RIGHT: Inscription Hand-written by Berta in old German, [Sütterlin] script. Meinem geliebten Onkel u. Tante und meiner Pl. reizenden Cousine zum Erinnerung von Eurer treuen Nichte Berta. 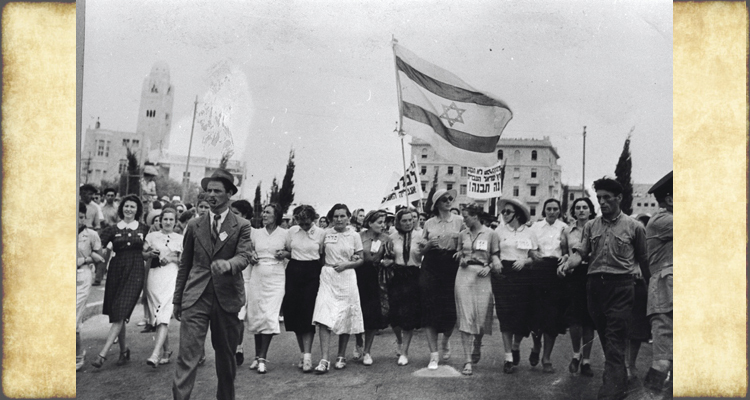 This photo, officially titled, “Women Protesting Against the White Paper, 18, May 1939,” was photographed by Rudolf Yunes. The photo appears here with the permission of the KKL - JNF (Keren Kayemet LeIsrael - Jewish National Fund) Photo Archives. 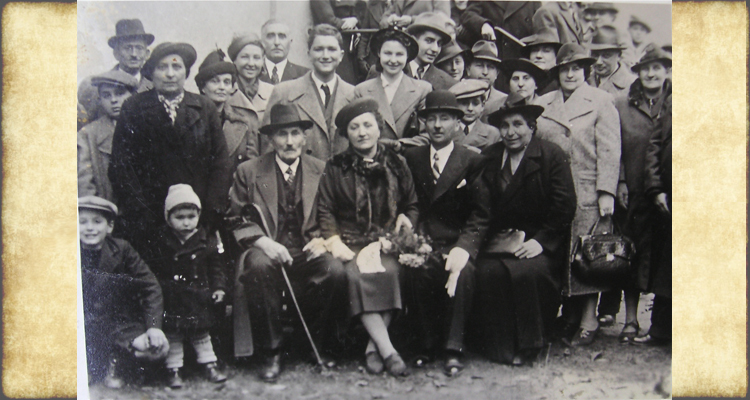 Nadja Jellinek, in a white striped dress, is the eighth woman in from the right side of the photo, near the photo’s center. She is facing forward with a stern and resolute expression. She wears a badge with the Hebrew word “sadran” (an official appointed to supervise arrangements or to keep order at a large public event). Seventy-four years later, in October 2013, Nadja recalled her two Betar commanding officers (seen marching in front of the women), and the Betar women members with whom she had locked arms and marched. Photograph of Hugo J. and Fritzi Fränkel, hands clasped together, on the day of their engagement in Brünn (Brno), Czechoslovakia. Permit me, with my beloved Hugole [affectionate diminutive form of Hugo’s name] in a hardly accomplished photograph, to introduce myself, and to express the hope that we will soon get to know each other personally, which would give me great pleasure. Dear Karl and dear Karla! I hope that you enjoy this picture! Send photos as well! Group wedding day photo taken on October 22, 1939, in Brno (Brünn). The city was then in the "German Protectorate of Bohemia and Moravia," formerly western Czechoslovakia. 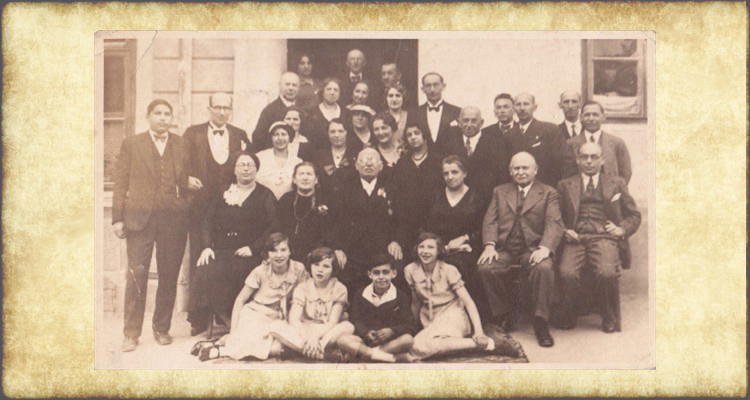 The man holding a cane, and seated on the left side of the first row, might be Fritzi's father or Hugo's uncle, Eduard Jellinek. Fritzi and Hugo are seated in the middle of this row. Hugo's youngest daughter, Anna Jellinek, is smiling and standing directly behind and in-between Fritzi and Hugo. A smiling young man stands to Anna's right. Hugo's middle daughter, Berta Jellinek, smiles and stands a little behind and to the young man's right. 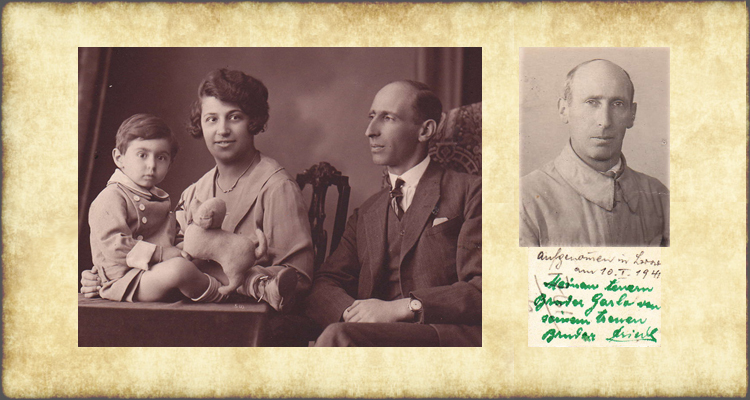 The young man is likely Heinz Rosenzweig, Fritzi's nephew and Berta and Anna's new cousin. 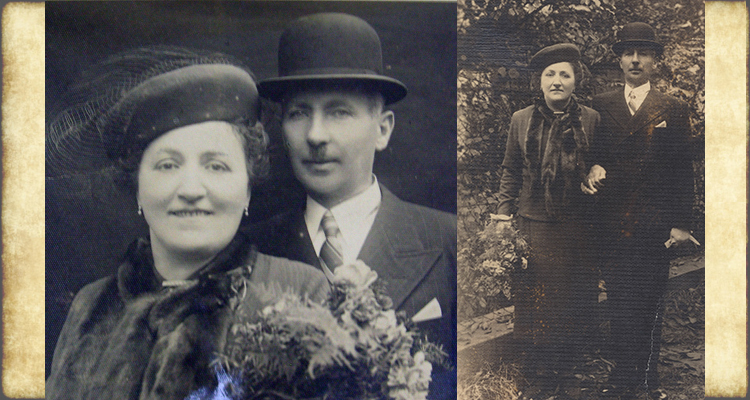 The woman wearing the tall dark hat and standing a little in front of and to Berta's right, may be Fritzi's niece, Olga Zwicker Havlova, who survived the Shoah. 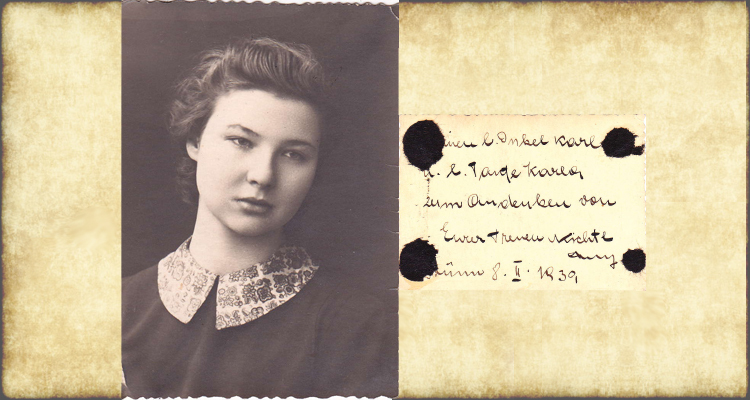 In a 1965 letter that Olga wrote to Gisella Nadja, she identified herself as Fritzi's niece. 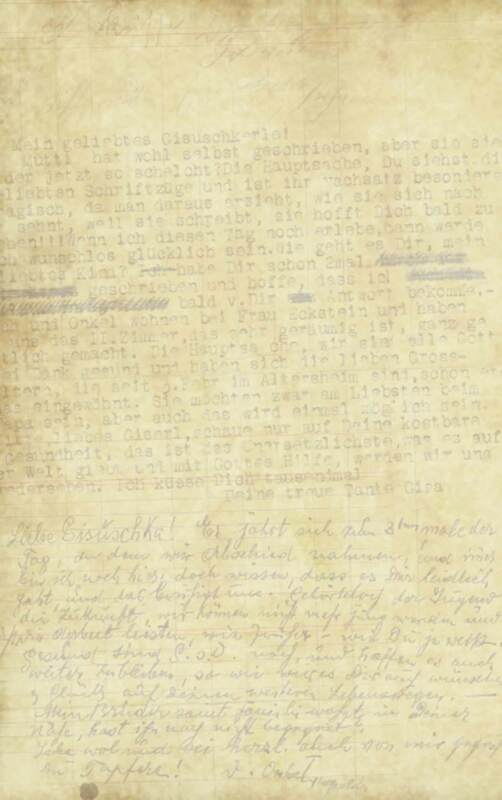 Olga's letter, in which she tells of her imprisonment in the Lenzing concentration camp for women and of having known Hugo Jellinek well, will be posted to this website in the future. Additional wedding day group photo taken on October 22, 1939, in Brno (Brünn), then in the "German Protectorate of Bohemia and Moravia," formerly western Czechoslovakia. 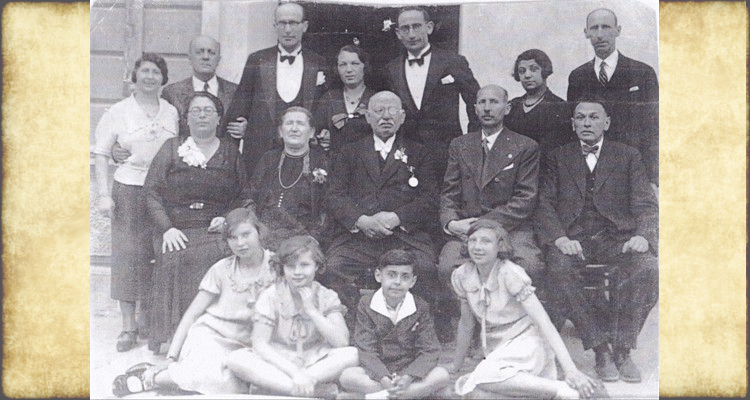 Seated in the first row are, from left to right: the oldest man seen in the photo, who may be Fritzi's father (or Hugo's uncle, Eduard Jellinek), an (unidentified) woman (who now has the youngest child in the photo on her lap), and Hugo's youngest daughter, Anna Jellinek. Fritzi and Hugo stand directly behind Anna and the unidentified woman. Hugo's middle daughter, Berta Jellinek, is standing and smiling directly behind the oldest man. The hatless, smiling young man (likely Hans Rosenzwieg) standing behind and to Berta's right now has his hand on Berta's collar. 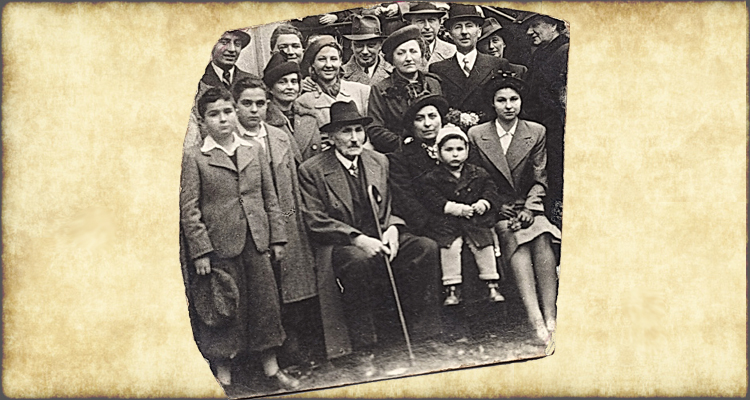 The woman wearing the tall dark hat and standing third from left in the second row may be Fritzi's niece, Olga Zwicker Havlova, who survived the Shoah. The tragic probability is that almost all of the other people in this group (those identified and those who, sadly, remain unidentified), who came together to celebrate a union of love, were separated and murdered within the following four years by the hate-filled Nazis and their collaborators. The range of facial expressions, especially Fritzi's, in these and in the wedding day group photos, reflects the fact that this wedding occurred fifty-two days after the outbreak of WWII and approximately seven months into the Nazi occupation of Brno. Overall, however, Hugo and Fritzi's love and marriage seem, to this writer, to be a testament to the strength of their resilience and spirit of defiance. Siegfried appears posed, but relaxed and somewhat detached in this studio portrait. 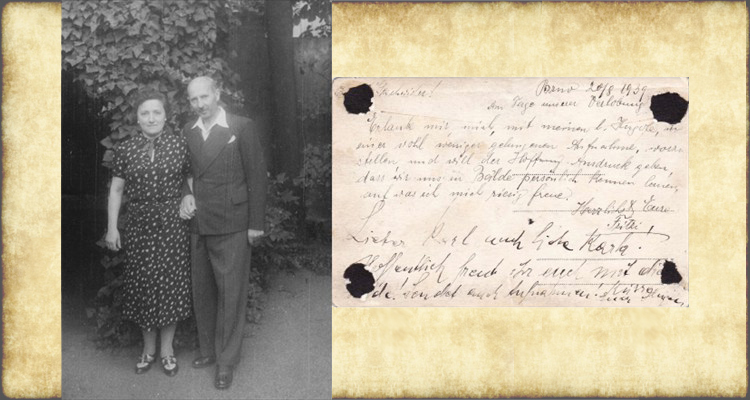 The handwritten text on the reverse side of this photo reads, in German: Meinem geliebten Bruder Hugo! 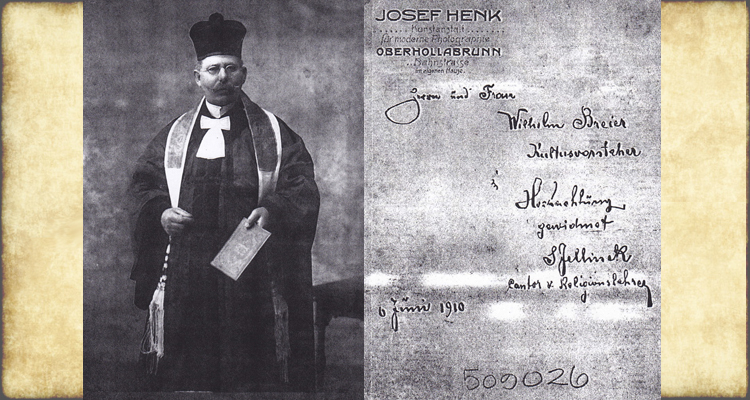 There is also a stamp of the Henk Studio, which includes the names of the photo studio's branches in the small municipalities of Stockerau and Retz in the Hollabrunn District of Lower Austria. This photo is only one and three-sixteenths inches high, and one and five-eighths inches wide. But this photo reveals, in a searingly powerful way, Siegfried's disillusionment, grief, suffering, aloneness and dignity. This is the only photo we have of a Jellinek family member taken after the person's understanding that there would be no escape, and while the deportations and horrific conditions leading to his or her death were in process. In addition, the contrast between Siegfried's expression and clothing here and in his 1926 family portrait [left] speaks tragic volumes about the destruction that the Nazis and their collaborators wrought. 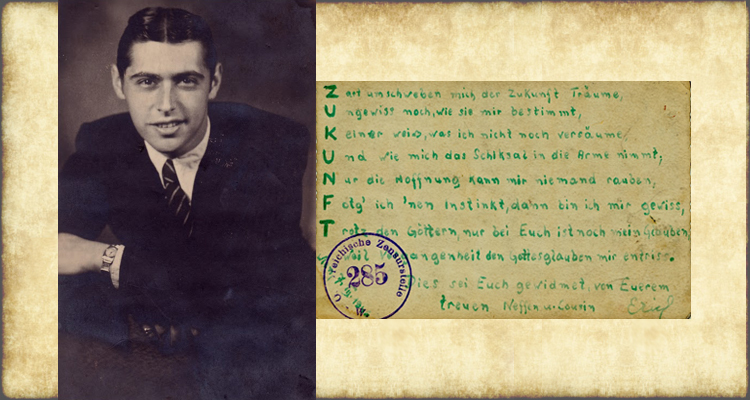 The January 10, 1941 date and the green ink used in this photo inscription tell us that Siegfried must have enclosed this photo in his January 18, 1941 letter to Karl Jellinek. My dear brother Garlo [Karl's familial nickname] from his loyal brother Friedl [Siegfried's familial nickname]. It seems remarkable that Erich appears to be unscarred and smiling in a warm, relaxed and confident manner, when one considers that this studio portrait photo could only have been taken after a maximum of thirteen months since the end of Erich’s traumatic imprisonment in Auschwitz-Birkenau (1942 - 45), and four years since Erich’s deportation, at age 17, from Vienna to Auschwitz, and his witnessing his mother’s murder. [Read more about this in the Biography of Erich’s father, Siegfried Jellinek.] The original photo was found among Karl Jellinek’s saved letters, photos and documents, thirty-three years after Karl’s death in New York City in 1977. In this poem, Erich displays more of the remarkable positive and resilient spirit manifest in his photo, but here, we can also see signs of doubt and ambiguity. It is difficult to ascertain whether or not Erich is expressing continued belief in God at the conclusion of the poem. Uncertain yet, what they decide for me. And how fate will take me in its arms. Hope is the only thing that no one can take from me. In spite of the gods, my belief is only in You. As the past tore my belief in God from me. “Wien, 7. III. 1946" [Vienna, March 7, 1946] is hand-written in the lower left corner. The letters and digits: “W. Oesterreichische [incompletely imprinted] Zensurstelle 285” appear inside the purple circle stamped in this same left corner. This was the stamp of the Austrian censorship office. The “W.” probably stands for “Wien” [Vienna]. “285” may have identified the particular censorship agent. The two portrait drawings shown above, are part of a group of seven, larger than life drawings that I created while thinking about my grandmother, Mathilde Nanzie Eckstein’s last days and moments before her murder by the Nazis in 1942. I thought about what expression might have been on Mathilde’s and other womens’ faces, reflecting or hiding what was in their hearts and minds as they walked to their deaths. 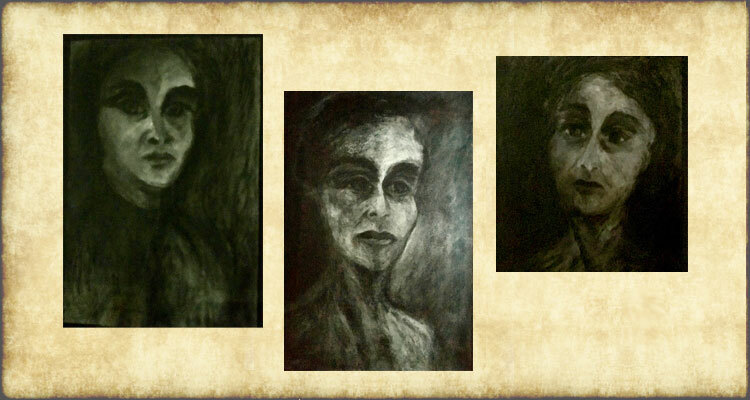 I worked the charcoal, mixed, scraped and scratched translucent wax with the charcoal. Gradually, expressions or intimations of inner strength and dignity emerged. They conveyed something between philosophical resignation, transcendent wisdom and inner peace, as well as anger, accusation and deep sorrow. 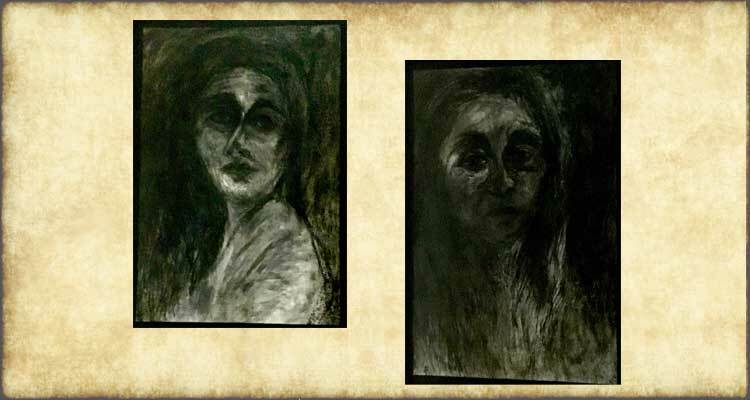 The three portrait drawings shown above are also part of the group of eight drawings titled, From Deep Inside the Darkness. Two other drawings in this group are shown on the preceding Image page, along with a brief statement about my creative process for all seven of these art works and memorial tributes. 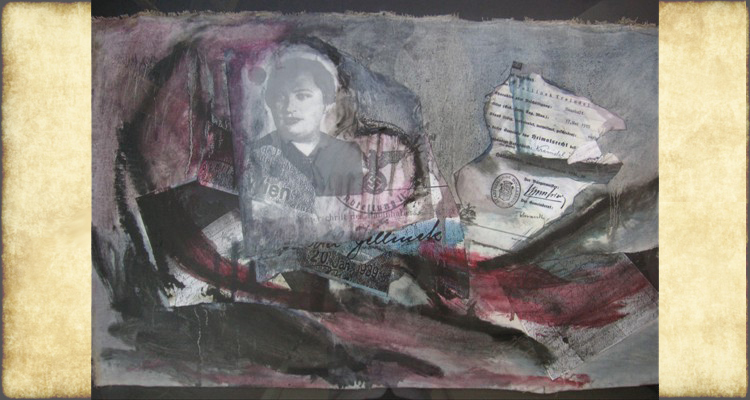 Media: oil, and collage of fragmented photocopies of Kreindel/Caroline Jellinek's passport out of the "Deutsches Reich", Kreindel/Caroline’s "Heimatschein" (Certificate of Origin), war-time letters, as well as mylar on canvas; approx.17" x 30.5". 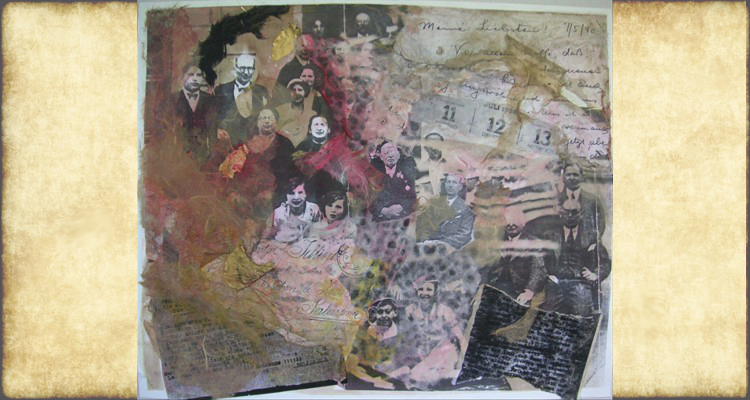 Mixed-media collage consisting of fragmented, altered photocopies of a 1933 Jellinek family group photo and of three family Shoah letters; as well as Asian papers, hand-dyed with acrylic and watercolor paint; 14" x 16.75".